Boliden’s mine automation programme is being led by Peter Burman. Even if it may sound like he works with developing smart digital solutions, his job is largely about establishing collaboration and promoting the mines as unique testing facilities. True digital transformation however, requires political decisions. This article is from a coming issue of Combitech's customer magazine Combined on the theme digitalisation. Several manufacturers have shown interest in working with Boliden. But finding partners for collaboration is only half of Peter Burman’s job. The other half is about working with processes, methods and training courses for integrating systems in Boliden's operations. The key is establishing an understanding with the employees of the entire system, according to Peter Burman. Everyone has to be able to see the role that their small part plays in the whole and how everything is tied together into a single long chain. It is first then that the advantages of digitalisation can be fully utilised. In the mining industry, new opportunities are also becoming available as the potential of the far-reaching changes is fully realised. 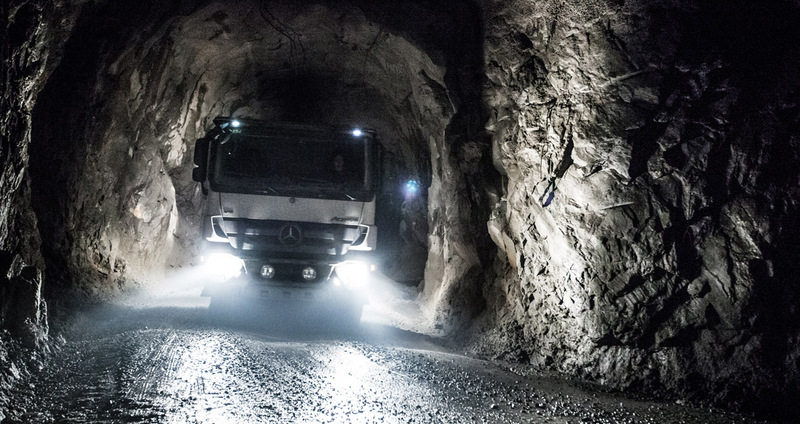 “The streamlining and productivity boosts of both mining operations and recycling, as well as digitalisation, make it profitable to extract and recycle metals that were previously left in the ground or deposited in landfills,” Peter Burman explains. Increased recycling brings us closer to the much-discussed circular economy, where a high degree of the material that is consumed can be reused or recycled, and that which is waste for one company is a raw material for another. Manufacturers such as Bosch, Electrolux or Volvo would just lease the metals and pay rent for them. After conclusion of the product life cycle, the metals would be “returned”. Waste, meaning the difference between the leased and returned raw material, would be financially compensated, which gives the companies extra incentive to try to recover and recycle as much as possible. Today when Boliden runs this idea by companies, it is no longer met with laughter but rather serious follow-up questions. The increased recycling assumed to be the consequence of a business model per the above also has positive environmental consequences due to the reduced need for extraction. In the same way that digitalisation is lowering production costs for mining operations, it can also lower costs for recycling. As an example, by using bar codes, chips and improved image analyses to sort goods, both traceability and precision can be increased. Here as well, self-driving vehicles can play an important role in making the transports of waste that is to be sorted more efficient. The recycling systems can thus on the whole, be made significantly more efficient. As things are today, many raw materials must be absolutely pure after recycling with, for example, no traces of lead. If the recycled metal is used to produce toys or articles that come in contact with food, this is naturally very important. But if the recycled metal is to be used as building material, for example, a low content of lead has no practical significance. Even so, no differentiation is presently made in legislation concerning how the recycled metal is to be used. It's naturally not the intention of politicians and civil servants for it to be like this. Many of those who work with environmental regulations just do not know how a market economy works, according to Peter Burman. Today it is counter-productive when there is recyclable material that cannot be recycled, but must instead be deposited in landfills.